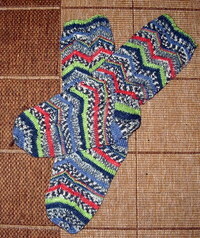 Knitting on an Island: Finished! Yes you read it right, and no I'm not bragging but at last I have finished the Christmas knitting. There was a last minute substitution when I realised that the yarn that I had bought for Dancing Daughter's Pointe shoe socks was just not knitting up right so thanks to Amy Sue who took delivery of some Knitpick patterns for me, and sent them on, I was able to run up one of those Bella scarves instead. I am really pleased with it. the yarn is Wendy Velvet touch which is approx DK weight so I downsized on the needles to 7.5mm, and knitted it about 4 feet longer - she likes her scarves loooong. Next up is Skateboarding Son's fingerless gloves. Like most of his wardrobe they are unrelived black. Not the best thing to be trying to sew up in artificial light! If you have knitted a pair of these, drop her a picture she is really interested in what people are doing with her pattern. 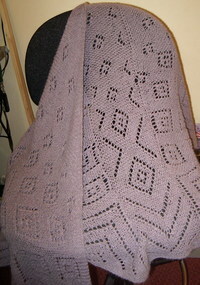 Finally and this is not for Christmas, I have been promising a picture of my finished Faroese shawl. It has already become a firm favourite and I am wearing everywhere it is so cozy! I'm not sure if I will be posting again before Christmas as the next few days will be spent trying to get the house straight and doing the last minute shopping. All your projects are absolutely fabulous! I love the pink Bella scarf. I've updated the Jaywalker gallery to include yours, as well as a link to your blog. Happy holidays! Isn't it a great feeling? I haven't been knitting with 2.5mm needles (I don't think I ever WILL knit with 2.5mm needles) but I have my gifts made and wrapped and ready to give. A beret, a lacy beanie hat, a shawl (crocheted), a knitting needle case (sewn), slippers! Merry Christmas to you, too!! I hope you have a lovely one, and come back to us rested and refreshed! Congratulations on finishing up your knitting in good time! You are all set for some relaxation now! Merry Christmas! You have some beautiful holiday knit gifts. I'm sure all the recipients will love them. Happy Holidays to you and yours! Your knitting is beautiful. Enjoy, celebrate and feel joy for Christmas. You deserve it! Merry Christmas to you and your family! What gorgeous knits - a great way to wrap up the year! 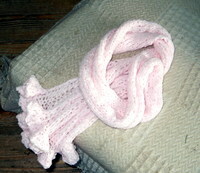 I love all of your knitted gifts and am especially fond of the Bella scarf! On We are on the Move!